Lifeline® Human T Cells-Negatively Selected (HTC) are purified from healthy donors and ready to use in studies of T cell biology. Human T Cells can respond to mitogens or anti-CD3 antibodies with robust proliferation and secretion of interferon-γ, tumor necrosis factor α and interleukin-6. Lifeline® HTC are cryopreserved immediately after isolation and purification to ensure preservation of all circulating T cell subpopulations and antigen specificities. 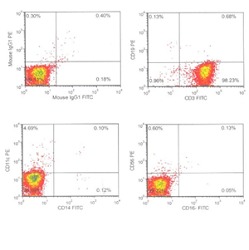 Our Human T Cells are quality tested via flow cytometry to ensure depletion on undesired cell types and are typically =80% CD3 positive. Lifeline® HTC are positive for CD3 and contain both CD4 and CD8 subsets. Lifeline HTC are negative for other lineage markers such as CD14, CD19 and CD56. quality assurance in every production run. Exacting standards and production procedures ensure consistent performance.